I don’t know if you’ve heard, but it’s a little crowded on the Internet. Right now in North America alone there are an estimated 313 million active Internet users, and it’s estimated that 128.6 billion emails are sent every day by businesses around the world. And just in the past month, 56 million posts were published on WordPress-hosted sites. And amid the hurricane of noise, your brand has the overwhelming task of competing against other users and brands for attention. You may find yourself asking, How on earth can I provide my audience with content that adds value to their lives, educates consumers about my product and contributes to a bigger conversation? The answer is a mix of curated and original content working together to tell your brand story. The difference between creating and curating content is the difference between painting a beautiful work of art and selecting which works are displayed in a gallery. “Creation” is your brand’s original content that captures your unique voice and point of view. “Curation” is strategically selecting and sharing relevant external content with your audience to play a leadership role in a larger conversation. 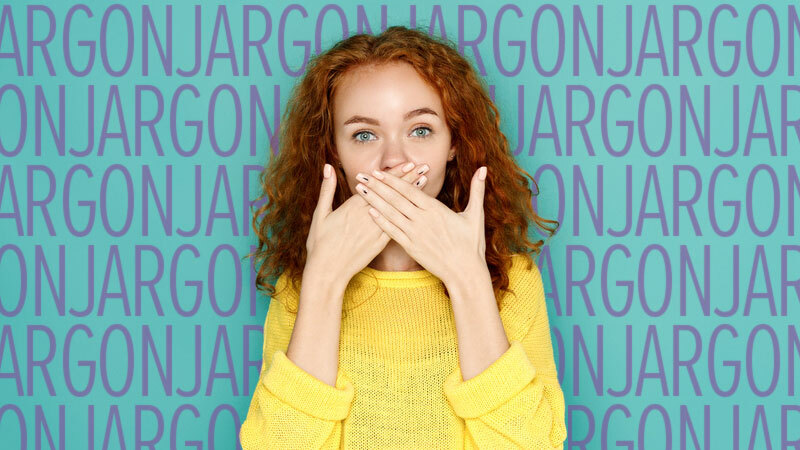 Both work together to create a distinctive brand voice and persona used to engage your audience. The main benefit of content creation is your home-court advantage: You know your customers, readers and supporters, which means you can create content that taps into their desires and needs and meets them in a helpful way. But don’t just take it from Ellie and me—here are some brands reaping the results of doing that well. The clothing brand Free People does a great job creating unique, original content that speaks to their audience. Their BLDG 25 blog and dreamy short films featuring well-known actors and models sum up the adventurous, good-vibes aspirations of their young female target market—starring their clothing, of course. 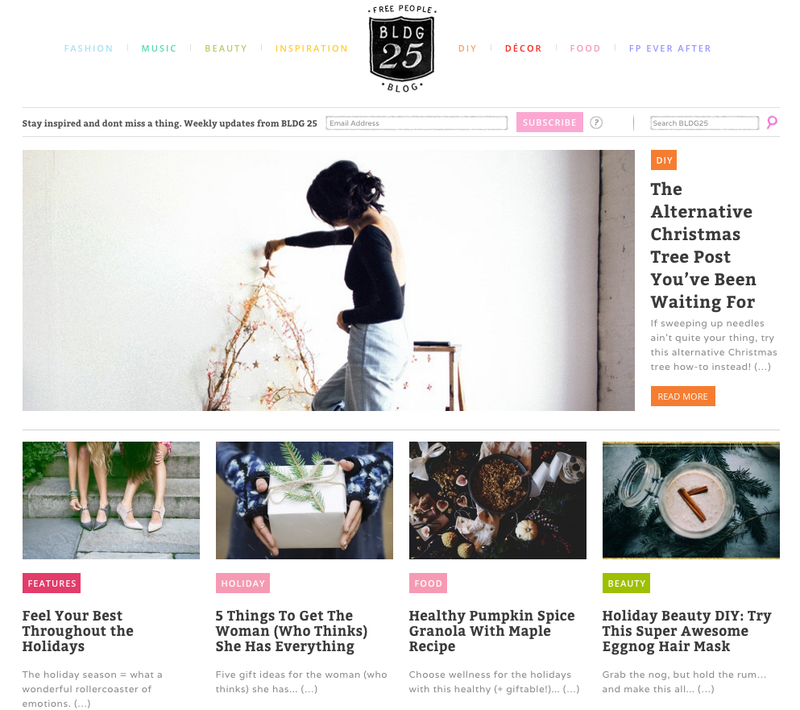 The BLDG 25 blog is not one large Free People ad (yawn), but a carefully constructed collection of recipes, health advice, inspiration and interviews with influencers, all housed within a Free People–branded presentation. 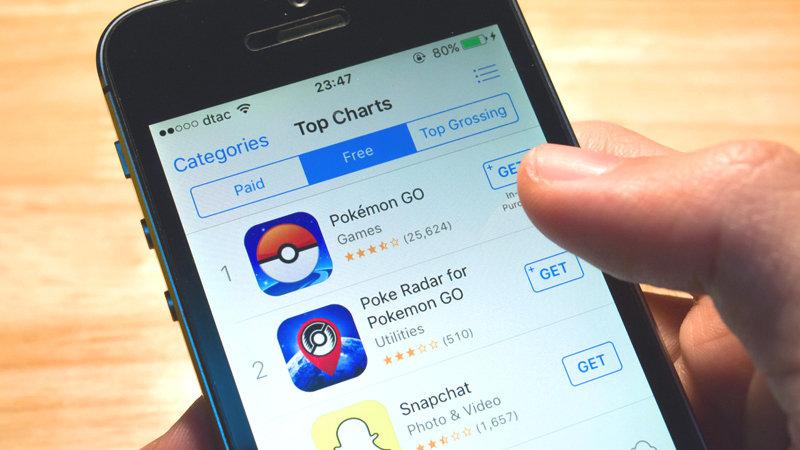 Sourcing their own unique content gives Free People the ability to craft that brand story via their digital outlets and ultimately enchant their customers. Knowing your audience is key to creating content that resonates with consumers, and I have yet to find a brand that does this in a sillier and more awesome way than Chubbies. This small supplier of a fraternity dude staple has a digital “Chubster Nation” following of cult-like proportions. Simply put, Chubbies are just short shorts, marketed with bro brilliance via their social media channels and “The Weekender” e-newsletter written in the native language of their audience. And Exhibit B on their Instagram account, a DIY project truly embodying the spirit of their brand. Case in point: When one of your brand’s tenets is capital-R Ridiculousness, it serves you best to control that message by crafting and sourcing original, branded content. This will ensure that your customers clearly understand what kind of experience you’re selling. 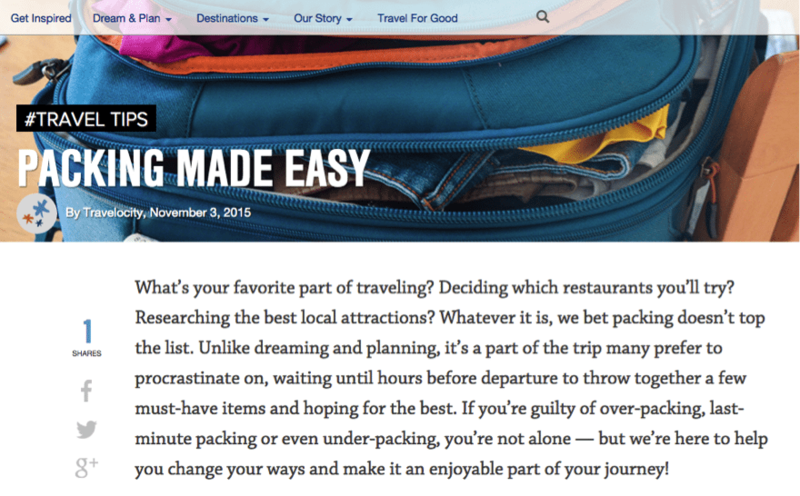 This is Travelocity in the element that serves them best: helpful information about travel that ultimately directs readers to the trips and services they offer. I would know—I clicked through to a roundup of Caribbean beaches and found myself flipping through pricing for a kayak trip in St. John almost without realizing it. 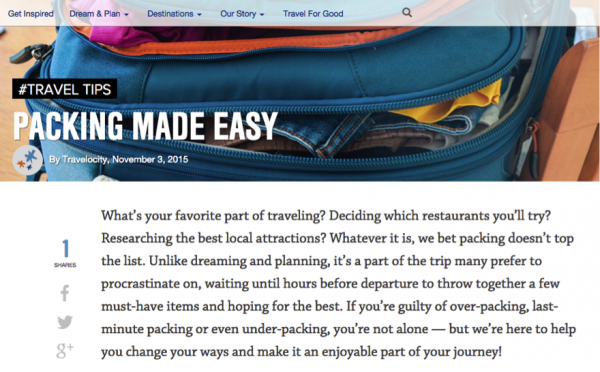 Because their blog content lives on the Travelocity website, it was very easy for me to toggle between their content and offerings. The voice didn’t change, either; their site’s consistency tied it all together into one seamless experience. Repurposing existing material is such an easy way to produce content, it can almost feel like cheating, but it’s not. Leveraging the resources already in your content vault is smart, as long as it’s done strategically. Repurposing content can be anything from refreshing an old blog post, to repackaging a timeless video about one of your best-selling products, to turning a ho-hum quarterly report into an easy-to-understand infographic. All of that content belongs to your brand, and you have more readers or followers than before who haven’t seen it yet. So be kind to yourself and your resources by thoughtfully recycling something old into something new. Why should you curate content? Two words: influence and value. In today’s world, the truest champions are the selectors of information—people who sort through the good and bad content and present their audiences with relevant info and new discoveries. In circles of influence and change, it’s strategically wise to position your brand as a trustworthy source of valuable information, not only by creating compelling and relevant content, but also by sourcing material created by a third party. When done well, curation can give your brand authority as a reliable source of helpful and interesting information for your audience. That’s kind of pie-in-the-sky, so here are three great examples of how that plays out in the real world. One of ModCloth’s values is making their fashion community feel like the best versions of themselves. 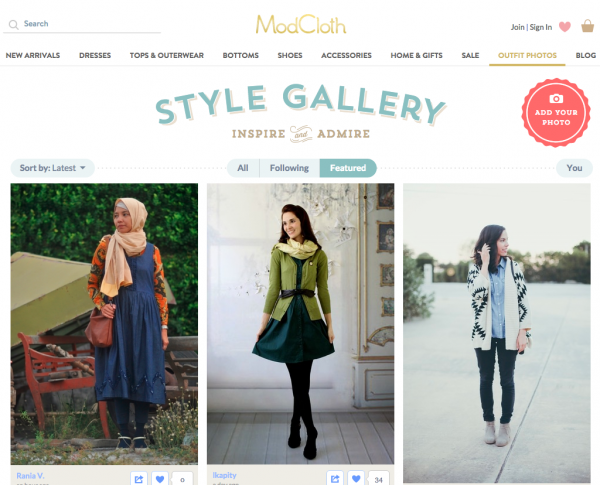 They do this with their Style Galleries, which are personal pages where users can post pictures of their spins on ModCloth’s products. This isn’t unique to ModCloth—a lot of fashion brands are doing this well—but the reason it’s such a success is how powerful it is to see a product worn by people of such varying ethnicities and body types. Curating these galleries gives Modcloth the opportunity to share a powerful, branded message about their values while promoting their products via their happy customers. If they sourced their own diverse set of models, that would be one thing, but letting their customers be the face of their brand is a whole other level of curation success. Curation isn’t limited to brands. Influencers can take advantage of the benefits, too. Tastemaker du jour Joanna Goddard of lifestyle blog Cup of Jo curates a weekly link-up list of things she’s discovered that her followers might like. Her loyal fan base doesn’t mind that she frequently plugs products—that’s why they’re there in the first place, because they trust her recommendations. 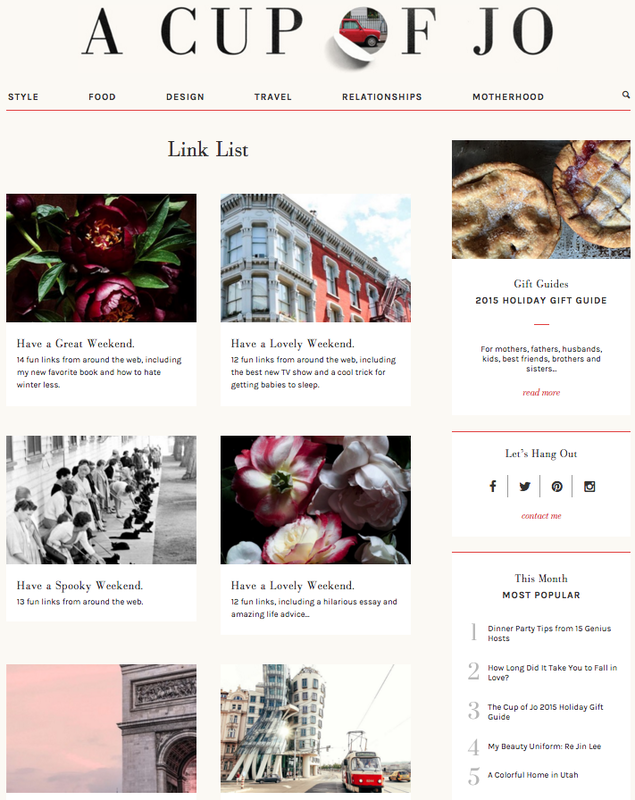 Their purchasing habits and her content are a symbiotic relationship that keeps her blog alive and her readers happy. If your brand already holds a leadership role in the circles you want to influence, or if you’d like it to, a great place to start could be a simple weekly link roundup on your blog like Cup of Jo’s (i.e. “On Our Wish List”, “Things We’re Reading”, etc.). If you’re consistent and provide relevance to your audience, you can establish your brand as a trustworthy source of industry-related material. 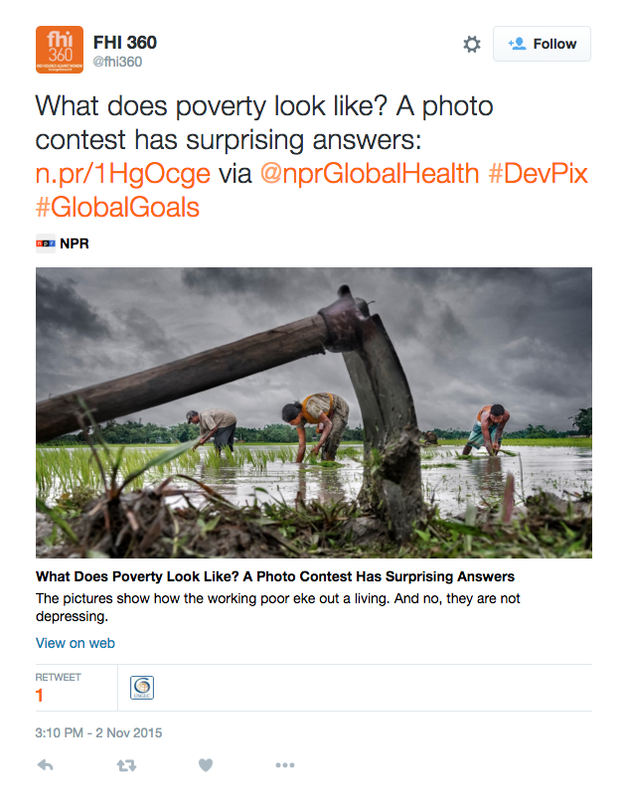 In the tweet below, nonprofit FHI 360 cultivates a mini-conversation within the larger conversation of global health by retweeting an NPR story on a topic their supporters care about. By curating articles, videos, charts and statistics like this, FHI 360 kindly does the weeding busywork for its followers and presents them with relevant, valuable content. With small nonprofits where the employees are already stretched thin, web presence can get pushed aside because of how time-consuming it can be. 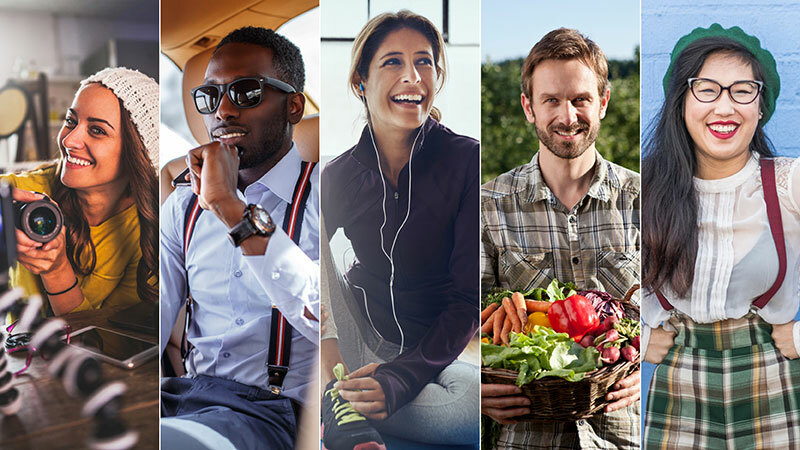 By curating material from around the web, FHI 360 connects with its supporters and beefs up their feed with great external content. More often than not, your brand will be using a blend of both strategies. Whether the “perfect” ratio is 10/90 or 50/50 is up to you. To determine what this might look like for your brand, you won’t have to look any further than your audience analysis, your budget and your team. Start with what’s realistic: How many hours per week can your people spend on creating content and curating content, period? Next, what’s strategic for your brand? What does your audience want to hear, and how can you say it in a unique way? What are your competitors doing, and where are the content gaps they’ve missed that you can fill? For example, if you’re in the athletic-clothing industry, perhaps your competitors haven’t created a documentary series about athletes with disabilities, or curated fan Vines in a weekly email. Finally, streamline your system to accommodate your creation and curation processes. Incorporate time each day into your schedule for reviewing, reading and watching material to find content that aligns with your brand story (keep track of everything with a tool like Pocket or Pinterest), and could be easily distributed across your brand’s various channels. Do you have any other stellar ideas or examples of great curation and creation? Or, any tips on how to use these two practices well? I’d love to hear about them in the comments below!